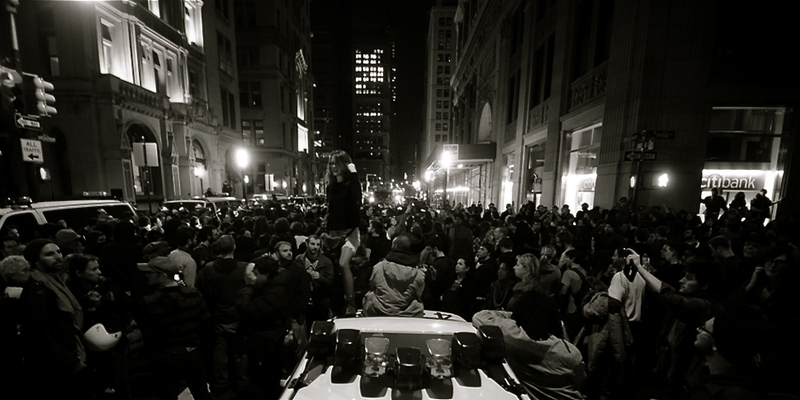 NEW YORK (Frameshop) – Yesterday, at 1am, the three-term billionaire Mayor of New York City sealed off all bridges, roads, and public access to lower Manhattan, then sent police in riot gear to raid Zuccotti Park in the name of public safety. Don Hazen expressed it best when he described Bloomberg’s offensive–thrust upon the protesters like a knife in the night–as the latest failure of imagination by America’s ruling class. Beyond all the legitimate outrage against ridiculously out of proportion police violence, Hazen directs us to a clarifying keyword. What has OWS achieved in this first stage of the movement? It has pulled back the veil for so many millions of Americans, helping us find the courage to see past the endless cycle of corruption, violence, and failures. NEW YORK (Frameshop) – It should come as no surprise that the Oakland Police Department–hurling enough rubber bullets and flash grenades to make a Columbian drug lord wince–finally raided the Occupy Oakland encampment at around 5:00am this morning. The justification for the using so much violence? According to reports, the OPD claims protesters were hurling water bottles, paint, and rocks. Within hours, Mayor Jean Quan was already praising her police department for keeping the park safe for peaceful protests.